For this year’s Winter Solstice celebration, I’ll light candles and raise a steaming mug of mulled wine to toast my loved ones. I think it is fabulous that diverse cultures around the globe greet this darkest time of the year with lights, feasts, and gift exchanges. I’m thousands of miles away – both physically and mentally — from the commercial shopping frenzy of an American Christmas. Nonetheless, I find myself thinking about gift-giving and feasting and the spirit of abundance and sharing that the season celebrates. Because I am a forager, the core of abundance for me is a direct, visceral connection to the natural world. That’s true even though I’m in cities much of the year. I feel abundance when I look at what the uninitiated call “greenery” and see a wealth of nourishing foods and healing medicines all around me. Another direct experience of abundance comes from harvesting in ways that actually improve the balance of the ecosystems I gather from. It is coming back to the same place the following year to find the plants healthier than ever…which means that I can harvest more, creating a perfect loop of thriving. Solstice blessings and wishing you an abundant and generous year ahead! I’ll be Stateside in the spring to launch my new book The Forager’s Feast. If there’s a great indie book shop or other cool place you think I should contact about doing a talk and signing, please let me know. And if there are any groups you think might be interested in a foraging tour, I’d love to hear about them. So far I’ll be in NY, CA, and NC. Give Someone (Yourself?) 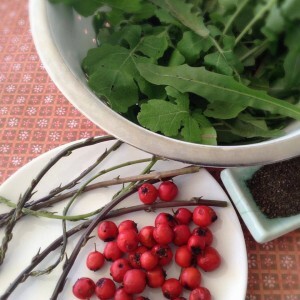 a Foraging Tour! The Forager’s Feast: How to Identify, Gather, and Prepare Wild Edibles is available for preorder! Part field guide covering 50 plants, mushrooms, and seaweeds with a widespread distribution, part cookbook for turning these wild edibles into delectable dishes, the book will be in your mailbox before the foraging season begins in Spring 2016!